I think that world can become divided when it comes to the humble pineapple. In our house rarely is Hawaiian pizza ordered because monkey doesn’t believe in hot pineapple, whilst I think it’s delicious. 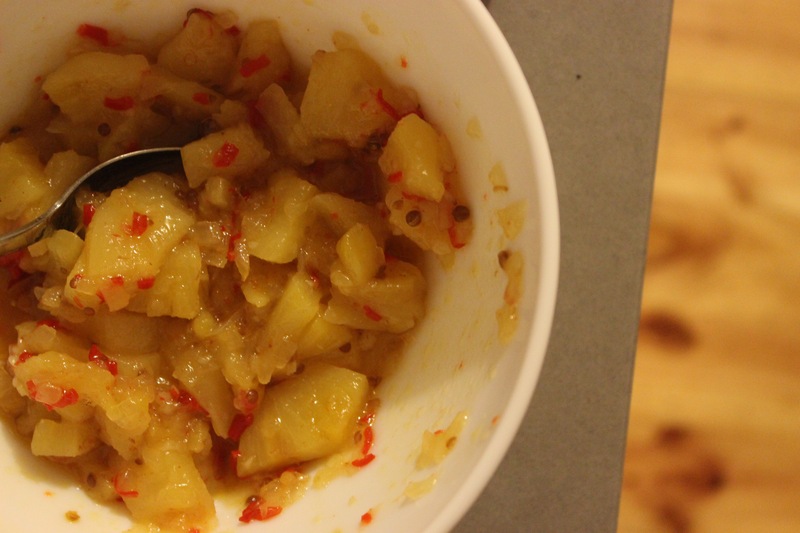 A whole pineapple can also be a bit of a minefield sometimes- what if it’s too sour? What if I leave it to ripen for too long and it just ends up brown inside? What if I don’t cut off the skin properly and I barb my tongue with a prickly bit? It’s a fraught world we live in hey? The pineapple also seemed to take quite a bashing in the 70’s- I’ve had the absoloute pleasure of seeing some horrendous ‘cuisine’ from a golden circle cookbook. Tropical bolognese? Hollowed out pineapple half with a dipping sauce? (Much classier than the classic Cobb loaf with spinach dip) or even just whack some delightful crushed pineapple over a nice fish mould… eeeeek! I think that one thing that most people can agree on is a toasted sandwich- how awesome are they? 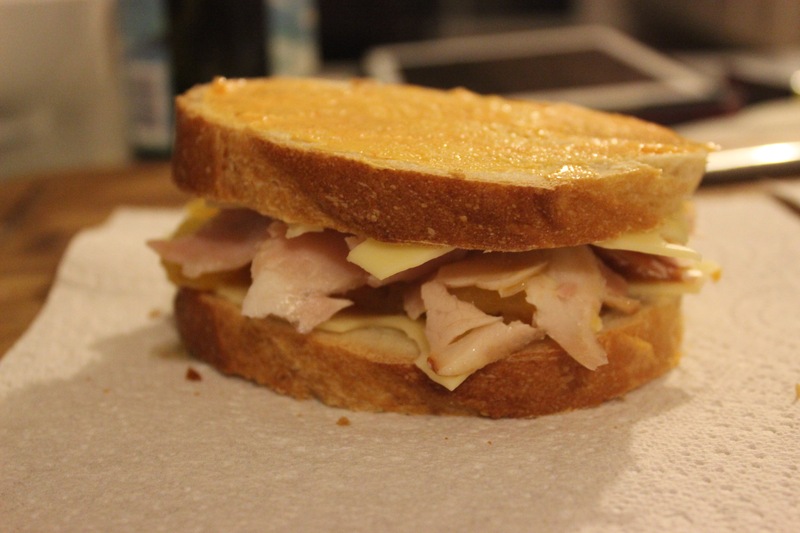 Well this recipe brings the best of both worlds together, it’s like a Hawaiian pizza in a toasted sandwich. This recipe had been waiting in the wings for some time and it was first cracked out when monkey was out one friday evening, I figured that he may not potentially like it given the hot pineapple situation so it was much easier to make it for myself and enjoy the deliciousness of the hot pineapple without judgement. Surprise surprise this recipe came from gourmet traveller. It’s from Analiese Gregory who is a chef at Bar Brose in Sydney- I absolutely must go there to eat one day- their bar food looks amazing and they have picked up a swag of awards of late- cheese gougere as big as your fist? Yes please! 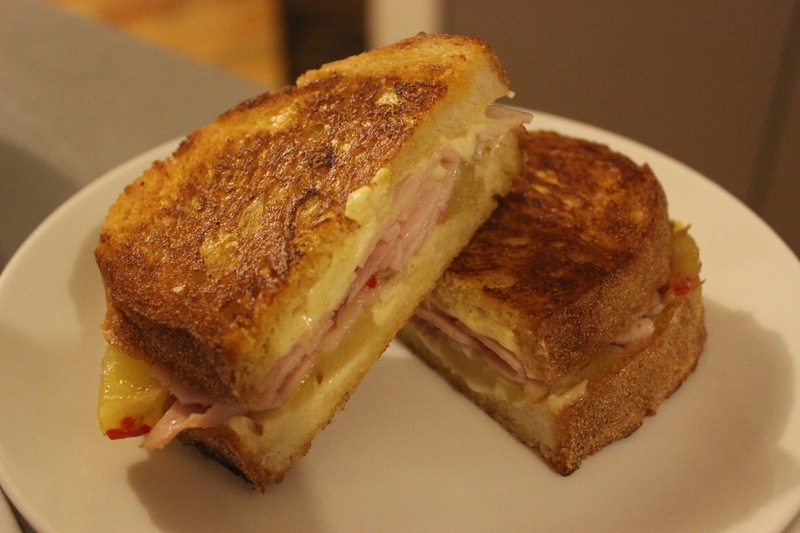 So nothing too crazy here- it follows your standard toasted sammich format- butter the bread on the outside ( i consider it a crime if you don’t), filled with cheese, ham, a slick of Dijon and in this edition a delightful pineapple relish. 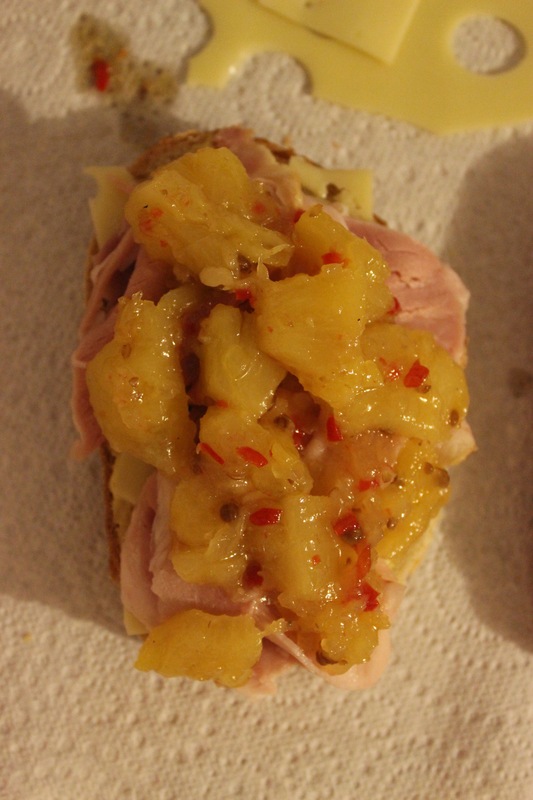 There are two things that make this something more than a humble sandwich- firstly the butter on the outside is a spiced butter mix and secondly the pineapple relish- so so good. I probably should have mentioned that you should get the butter out of the fridge before you make the relish to let it start softening up. 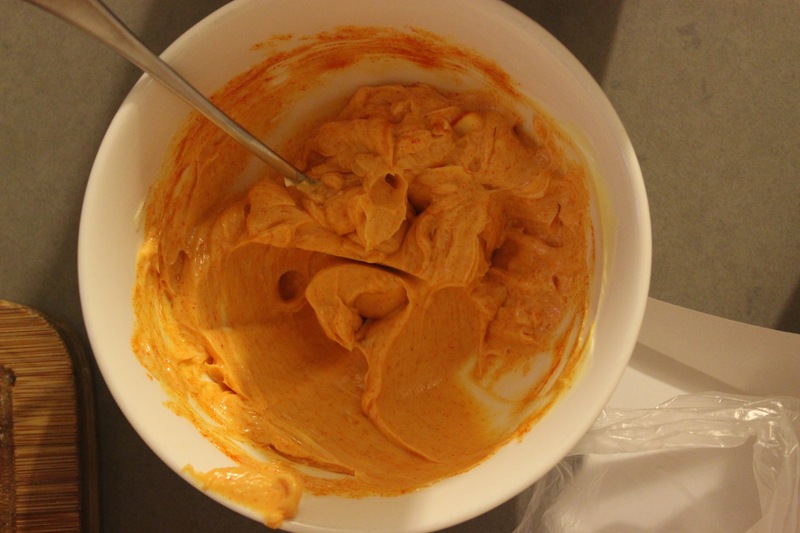 The spiced butter is the easiest bit of all- get butter, mix in smoked paprika and cayenne (I skipped this bit), season to taste, stir- done- winner. Assembly time… hold onto your hats! Gather your bread- this recipe uses rye bread which I could get the first time I made this but the second time it was just a straight sourdough- both are great- preference is the rye but it was a close race. 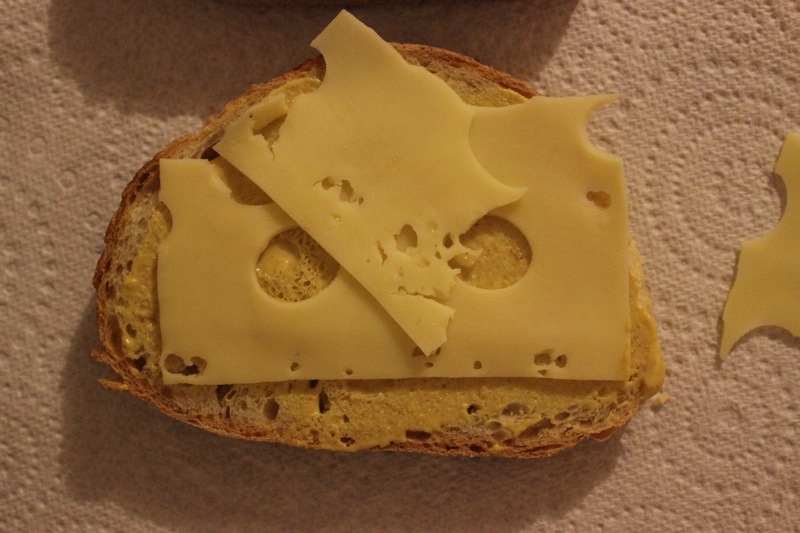 Next cheese- recipe asks for gruyere- I just used the good old sliced Swiss cheese from the supermarket and ham. This one asks for thick slices but I just used a shaved ham- best you can get of course- nothing too salty and with a nice smoke. Lastly Dijon- I have the old faithful jumbo jar of Dijon from Costco that’s been living in the fridge for a while- mustard has a long long shelf life! 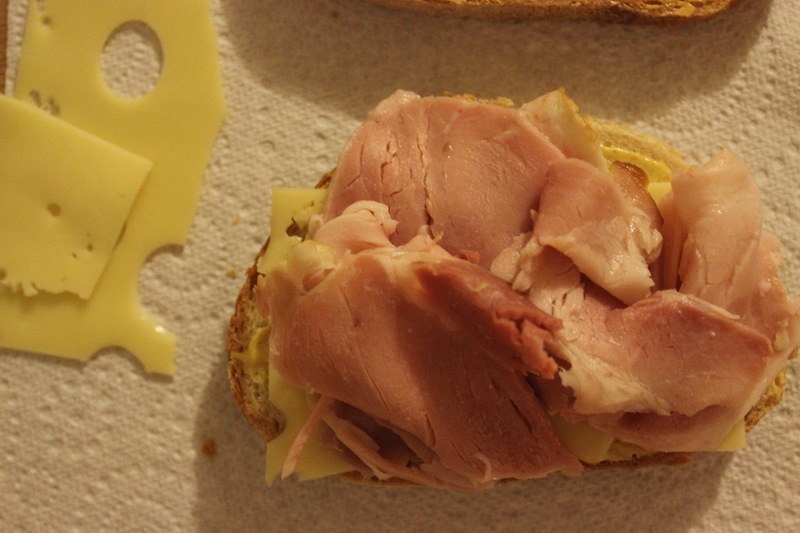 Butter the outside, Dijon the inside, cheese, ham, relish, cheese and pop the lid on- butter side out! Then it’s cooking time- I’ve just done these in the sandwich press but I think that they would also pan fry up pretty nicely- cook until the cheese has melted and its nice and golden brown and crispy on the outside. Try it- especially now it’s summer and the pineapple is sweet and delicious- once you’ve tried it I know you’ll want it again. Toasted sandwiches are generally a quick fix and this one does take﻿ a little longer because of the relish but I think it’s totally worth it. Because seriously look at it? How could you not want to eat this? Make your next toasted sandwich a tropical one- I’m fairly certain it will be coming back up on the sandwich rotation again very soon….